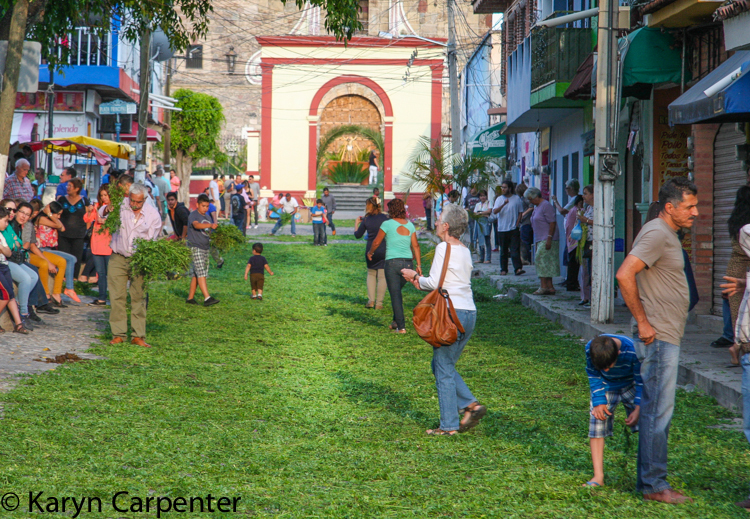 Palm Sunday, the streets near my house glow green from the clover which is spread on Hidalgo, the street that leads to the main Cathedral in town. Before evening mass, Jesus rides a donkey up this street, flanked by men in period costume, and followed by a silent procession of hundreds of the faithful. 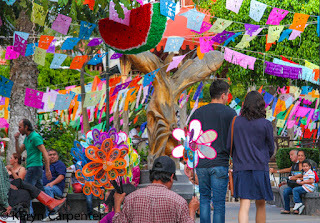 The nearby plaza is a riot of color from bright crepe-paper banners. As evening progresses, bands play in the gazebo and thousands of people sample food from small mom and pop stalls. Homemade signs advertise tacos, enchiladas, sopas, and Mexican coffee. Families stroll arm in arm, snacking on ears of corn. Beautiful young women in heels lick the ice cream that is melting from cones, and children break away from their parents to chase each other, tossing paper eggs which burst with bright confetti. Thursday evening, the church holds mass outside, and afterwards a passion play is held on a stage which has been erected at the plaza for the event. Things are not looking good for Jesus. A block away, the women have gathered in the streets to begin hanging the purple and white crepe-paper banners which they have been making for days. I wonder at the dynamics of the groups that work together, of the one or two single families who do their own decorations. We begin at 10, working by the glow of a few street lights and a nearly full moon. By midnight, street traffic has died down and a few men appear, lean ladders against walls and climb to the rooftops where they pull the long strings of banners into the air and attach them to tops of homes. Good Friday morning arrives and people are out early. Soon, Jesus will be marched from the Church up our street into the mountains where he will be hung on a cross. Those neighbors who didn’t get their decorations up last night must finish decorating now. At the base of each block, special “gates” are built with palm fronds and decorations more elaborate than the thousands of alternating purple and white crepe-paper banners that line the way to the mountain. 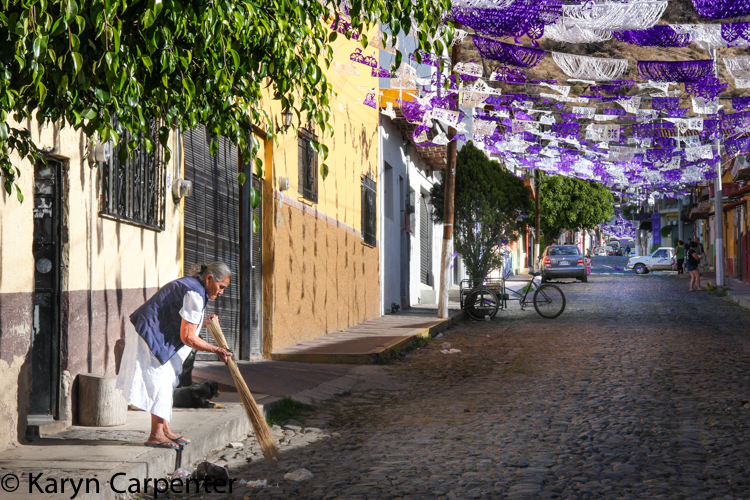 Police remove cars that are left on the streets, and brooms appear as grandmothers and daughters sweep dust and scraps of paper from the cobblestones. I have invited friends to my home to watch the event, lured to join me with the promise of homemade blueberry waffles. We know that trials continue in front of the church and soon Jesus will make his appearance. Unlike most other Mexican processions, this one is so quiet they have begun to pass the house before we know they are upon us. We rush to the door just as Jesus passes my house. 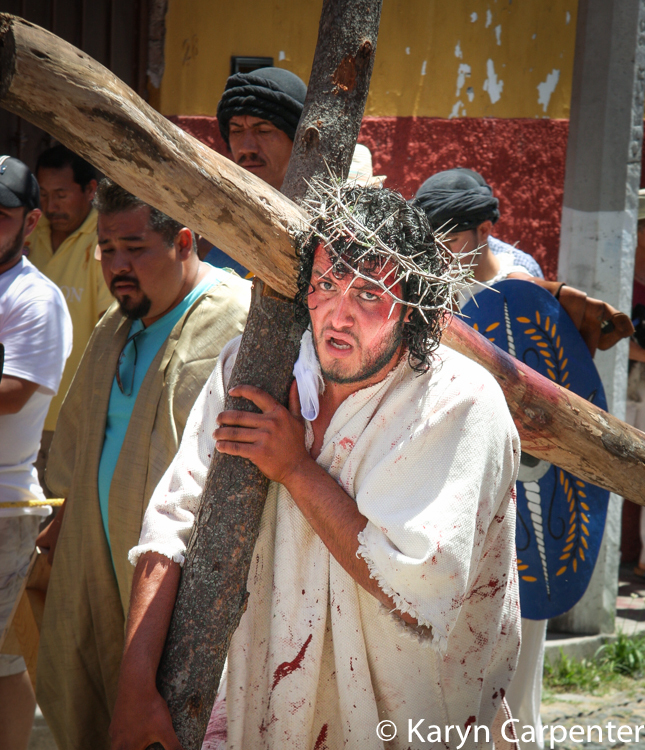 His blood covered tunic is hot in the Mexican sun, even at this altitude, and he trips and falls. He has walked only 2 1/2 blocks at this point and he has a mile or so to go, dragging 200 pounds of rugged cross over his shoulder and up the steep mountainside. A woman stops and tells me she had a friend who’s husband played the role of Jesus a few years ago. The role is so grueling that they practice daily for a year to build up strength. Our streets are cobblestones, a challenge to walk on for anyone, but the weight of the cross bounces with each stone that it hits, digging the wood into shoulder of the man who has accepted this role. Down on his knees in front of the house, Jesus' guards surround him, give him a moment to rest before helping him to his feet so he can complete the march up the mountain where he’ll be hung from those rugged branches. This is just too hard to watch. Though many follow and spend the day with Jesus high in the mountains above our lakeside homes, I can't go further than the nearest corner. I pray that the Jesus actor made it okay and I'm glad for the two ambulances which follow the procession into the mountains. This is fascinating, Karyn. I love the clover-covered street, the purple and white banners, all the colors. That's a great shot of the actor who played Jesus. Practicing for a year to build up strength? Wow!